Would you manage your own logistics workforce if you could do so at the least total cost? Many would say "yes." They like the direct control over operations this gives them and the "insider knowledge" their own staff bring about the company's operations. But what if you could get this same level of control and knowledge by working with a 3PL that could also drive down your staffing costs 10%–20%? Today, that's possible. And it's all about TRANSPARENCY. Let's look at how 3PLs can function as a seamless extension of your operation. While you or a staff member may not be on the warehouse floor, technology allows you to be there virtually. Let's say a new point-of-purchase display is being built and you want to ensure it looks perfect before being shipped out to stores. 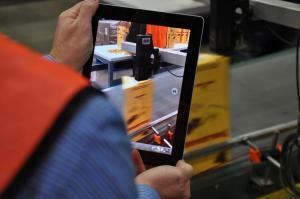 Using Pack Manager software, a 3PL associate with a tablet can take and upload pictures from the assembly line. Using your own login, you can immediately view the photo and approve the display or note changes – whether your office is across the street or on the other side of the world. Visual management has become a popular strategy to drive productivity and quality. Real-time metrics boards on the warehouse floor announce the performance of work teams against target KPIs to staff and customers. The same results can be reported and available online. The best results come when 3PL managers collaborate daily with customer teams, sharing ideas and reviewing work plans. KANE has daily morning meetings with select customer teams. When you listen to and observe these integrated work teams, it's virtually impossible to distinguish customer from 3PL. Today's sophisticated data communication capabilities allow just about any system to talk to another. Whatever data you want – inventory, order status, quality metrics, productivity metrics – you can access it in near real time, regardless of where the data resides. As the outsourcing company, you want your partner to be a seamless extension of your business. With today's technology and work processes, you can gain the benefits of outsourcing warehouse labor management while staying in touch with and in control of daily operations.